In my recent post about last year’s Surfers Healing Dinner, I told y’all about the amazing gift we received from a volunteer at that event. 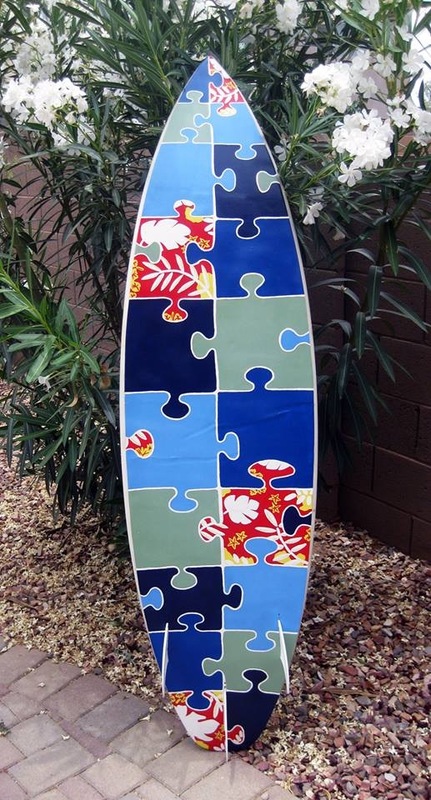 A surfboard to display in Cannon’s room! I told you about how the gifting happened. About the kindness of 2 strangers who, while moving cross country, drove it to us in a 2 door sports car. Soon after the event last August, I saw a photo. A photo that made me wonder. 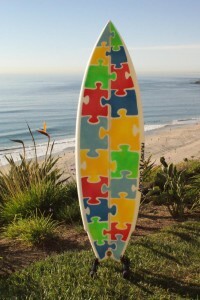 See, the board we were given had a black and red checkered pattern that was weathered from, no doubt, many great waves. 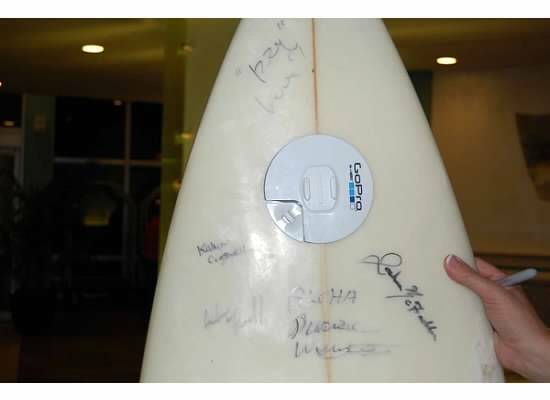 And the surfer’s name was written on it. I wondered if painting it was an option. Just to make it match better in his room. And then I saw this photo. Surfers Healing was having an annual auction to support the org. Professional surfers, surfboard designers and companies donate boards to be auctioned off with all proceeds benefiting the organization. I looked through the pictures of the boards even though I couldn’t quite afford to bid on any. And I went crazy when I saw this one………. It was PERFECT! 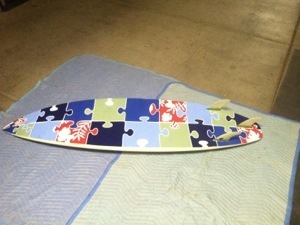 I fell in love with the idea of having a board with different colored puzzle pieces on it! A symbol of Autism. It would be a way of blending these two big, defining things in Cannon’s life. His Autism and his love of surfing. 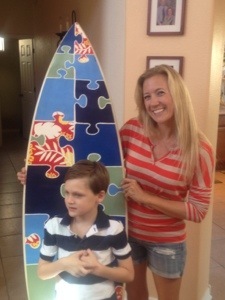 And with the board set to be displayed in his therapy room. The room that was specifically designed to encourage, strengthen, and comfort him. It would make it that much more perfect of a space! I asked Jessica, the artist, what steps were involved in this project and this was her answer. First, she washed down the board and taped off the edges to make a “frame” of sorts. The fins were also taped. Three coats of primer came next. She penciled in the puzzle pieces and colored them in with the solid colors. Making a rough plan so she wouldn’t end up with 2 of the same colored pieces next to or touching each other. She, then, painted 3 coats of each solid color. After that, a fine brush was used to outline and edge between the pieces in white. This also took a couple coats. Next she drew in roughly what the pattern would look like and painted them in white. And went back with additional colors (yellow and red) adding accents and such. The fins were painted white. 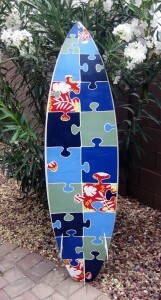 Finally, when it was bone dry, 2 coats of satin finish spray varnish were added and we had our beautiful “new” surfboard! We don’t just like it Jessica! WE LOVE IT! It is perfection! I couldn’t have even dreamed that it would turn out this fantastic! We can’t wait to hang it and finally share pics of Cannon’s amazing therapy/bedroom with y’all! Until then…….may God bless!! Cannon’s surgery day went relatively smoothly. After dropping off Townsend at a friend’s house, we drove to the hospital and arrived on time. 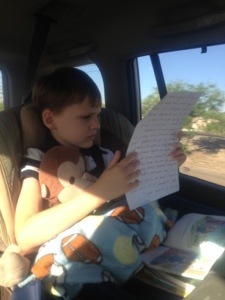 In route, I gave Cannon the social story I had written to explain what was going to happen. It went a little something like this….. 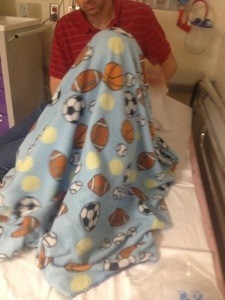 When we got to the hospital, he was a little nervous in the surgery waiting area. And this is what he does when he feels that way. To hide, shut us all out, and calm himself……. We consulted with both the Interventional Radiologist and Anesthesia. Over time, we have figured out the most humane way to get Cannon to sleep is to do it quickly and without the trauma of putting in an I.V. while he’s awake. I carry him into the Operating Room, sit in a chair, the Anesthesiologist comes up behind me and puts the mask of the gas over his face. I give him lots of cuddles and reassure him that all is going to be ok. Within 30 seconds, he is out cold. THEN, they take his clothes off, get an I.V. in, and begin the procedure. It’s better for everyone this way and I am so thankful that the docs are willing to change things up and do what is best for MY child and not what’s protocol. The Hospitalists have always called Cannon “The Anti-Protocol,” for many reasons. And it is so true! After they got him down and I helped them remove his clothes, we were banished to the Waiting Room. To wait for the next hour. The Anesthesiologist popped his head out and told us that things went well and a nurse brought us back to the PACU. They always come and get us immediately when he gets back there and don’t wait until he wakes up. They have learned the hard way on that one and I am afraid he has a bit of a reputation. When we arrived we noticed he looked like a pin cushion with multiple needle stick marks on each hand and on the inside bend of his elbows. Along with not 1 but 2 I.V.’s. The Anesthesiology Resident explained that they had had a terrible time getting a vein. That he has tremendous scarring on his veins. So both the Anesthesiologist and Resident were working on either side of him to try to get one. They each did and at exactly the same time. Hence, the 2 I.V.’s. They apologized quite a bit for that. Cannon was scheduled to get a port last year about a week before his first button surgery. Because he had no more veins left. 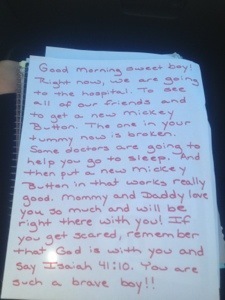 But, they canceled the surgery at the last minute because they hoped he wouldn’t need it after the button surgery. And wouldn’t require frequent hospitalization and labs. Cannon also had a lot of irritation on his skin from various placements of tape. Particularly on his face where they had to tape his eyes shut to prevent a corneal abrasion, and also his chest and arms. The only other issue was that his resting heart rate was really low while he was asleep. The nurse gave him a decent amount of oxygen and just watched him a little longer to be sure he was ok. When he woke up, he was very reflux-y, heaving heavily, and flirting with getting sick quite a bit. He was extremely hungry and thirsty as well so it was hard to get him to eat and drink slowly so he wouldn’t throw up. But overall, he did great and the actual tube placement went excellent. The Interventional Radiologist said that “the pathway was well formed” and the removal of the old button and placement of the new one turned out to be very simple. THANK THE LORD! And all of you for your prayers! After getting over a lot of the grogginess, resting, and showing the doctor and nurses that he could eat and drink without getting sick…….we were discharged! We did decide to make a quick trip up to the floor of the hospital which was a second home to us for quite a while. To say hi to some of the nurses and PCT’s. And to stop by Child Life for some Beads of Courage. I had figured out how many he was owed for various procedures, tests, pokes, dressing changes, flushes, etc. And it was an outrageous number. So, Lauren, the fabulous Child Life Specialist, and I decided a couple of things. 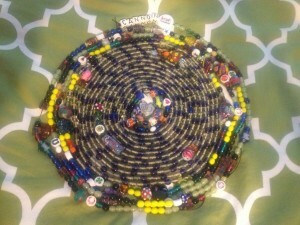 1) We would use “100 beads” for some of the categories. Like he was due to get almost 400 grey beads which are for dressing changes since our last collection in mid-November. So, instead of actually giving me that many individual beads, Lauren gave me 1 grey bead to put on his strand….along with 4 separate and larger “100 beads” to place after. 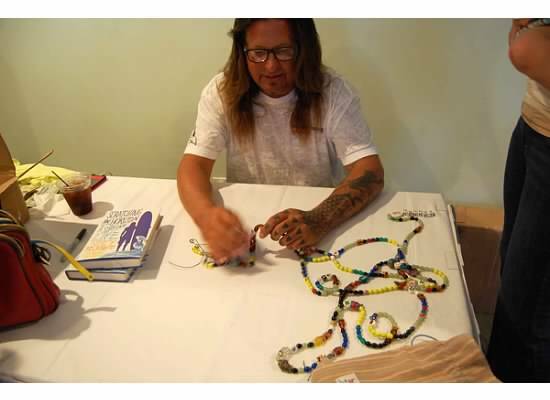 And the same was true for the nearly 200 purple beads that would represent his flushes. 1 purple bead and 2 “100 beads.” 2) I also made an executive decision. 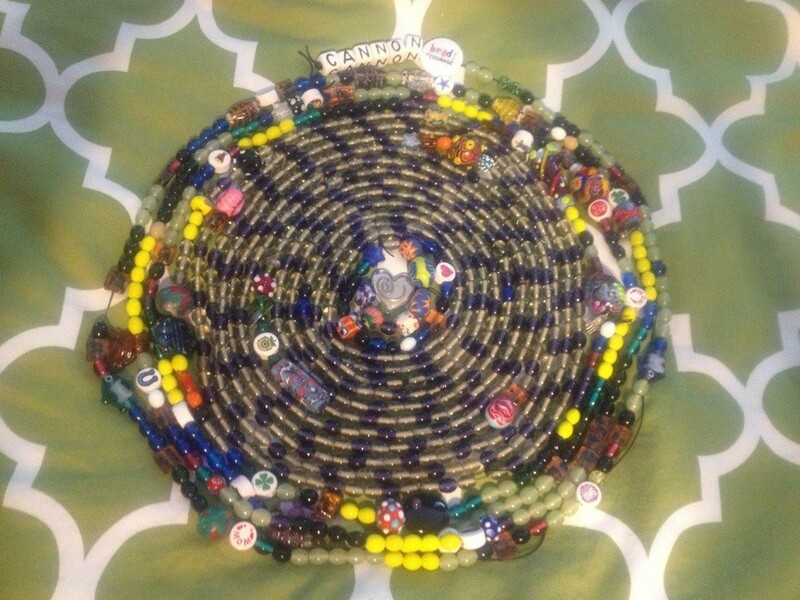 Cannon has accumulated hundreds and hundreds of beads to date. And gets 3 a day on a good day. I decided this was a good time to get his “end of treatment bead” and save some beads for the other kiddos who deserve them. 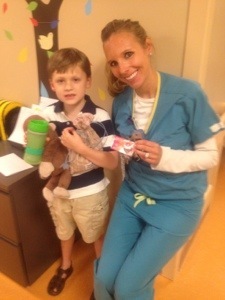 This is Lauren presenting Cannon with that very special bead! Thank you Beads of Courage for blessing Cannon with such an amazing way to tell of his journey. 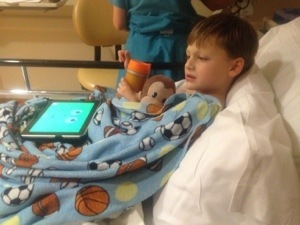 And thank you to all of our incredible prayer warriors for praying him through his surgery! His is doing mostly ok. Doesn’t seem to be in too much pain. He was up most of last night and couldn’t keep anything down for about half of the day today. But things got better in the afternoon and he was able to eat about 2/3 of his dinner. And he has all of his normal energy back! Thank y’all for checking in on our little man and God bless each and every one of you! Hi all! Tomorrow is the day! The day when, bright and early, whether I like it or not, Cannon’s Chait Button will have to be replaced. Like I mentioned in my “Follow Up” post a couple posts ago…….every 9 months-1 year this will have to happen. Any prayers are greatly, and I mean greatly, appreciated. We are a bit nervous even though all should be well. It should be. There is a decent chance though that the new button will not go back in the pathway. Last July, when he got the Chait……it was such a tough decision and transition. We hated that we had to do this. But Cannon’s body and the doctors were telling us it was time. We had no other choice. He had a terrible, terrible, LONG journey to accepting it. But now, we completely appreciate it and we don’t want to imagine life again without it. We do NOT want to go back to a time when he is in the hospital every couple of weeks. And hurting all the time. Not EVER again! It’s funny……we have had 2 calls from the hospital. Both from nurses giving us instructions for before, during, and after the procedure. But neither of them had ever heard of a Chait Button. It is still amazing to me how rare his device is and how few people in the medical community are aware of it. 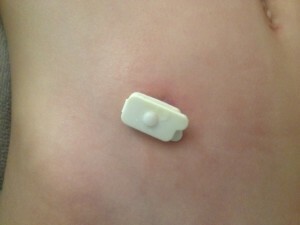 Here is an above the skin and a below pic of what the Chait Button looks like. If all goes well, the whole thing could be fairly quick and with observation time included……we could be out of there by early afternoon. And if it doesn’t…….well, we will cross that bridge if we get there. 9 a.m. tomorrow is the scheduled time. Again, we would be so honored and thankful if you could partner with us and pray our little man through this! And now I am off to bed…..praying Proverbs 3:24 will be true. “When you lie down, you will not be afraid: when you lie down, your sleep will be sweet.” LOVE TO ALL! The evening after the Surfers Healing event of 2012, the Tides Hotel (whose beachfront hosts the event) also hosts a dinner. Actually the Blu Restaurant inside the Tides Hotel hosts it. 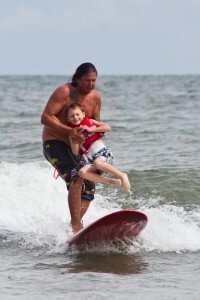 Families, participants, volunteers, and surfers attend. There is a fantastic buffet style dinner, entertainment, and a raffle. My parents, sister, and my little family of 4 were all able to go and enjoy this time of celebration after such a great day at Surfer’s Healing! This year’s dinner was much more crowded than last. In fact, there were so many people there that the hotel had to set up a bunch of tables and chairs outside of the large banquet room to accommodate everyone. A little embarrassing! And I could not get him to stop without meltdown. He just eventually got so tired that he laid down on my shoulder for good and fell oh so very fast asleep. Like snoring, mouth open, completely conked out sleep. It was pretty hilarious! 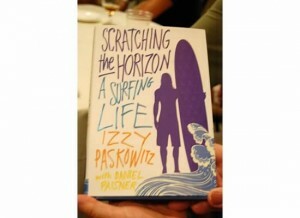 Izzy Paskowitz, the co-founder of Surfers Healing, who Cannon had gotten to surf with……wrote a book this past year. It is called “Scratching The Horizon: A Surfing Life.” He was signing books at the event so of course……we had to have one! This is how he signed Cannon’s! Pretty cool guy, huh?! We had promised to bring Cannon’s Beads of Courage to the dinner so he could see them. We were telling him about the org as he had never heard of them. I think he was amazed with how cool the org is and how many beads Cannon now has! Then, came time for the raffle. There were so many great prizes. Not just several boards but bikes, gift certificates, and much more. I so hoped we would win something. We had bought so many tickets. But, we did not have much luck that night. None…..actually. We came up empty handed. Oh well! The next challenge was how to get it back out west with us. It’s big and costs a lot to bring on a plane or to ship. We kept hearing a $200 figure. My parents had been thinking about making a trip by car so it sat in their SC garage…..waiting for when that might happen. At Christmas time last year, we were back home for a visit. And my good friend, Melissa, and I were talking about the board. She mentioned that she had some military friends moving out our way and that she would ask them if they had any room to bring it with them. By the end of our visit, she had a commitment from them to do just that! AMAZING! 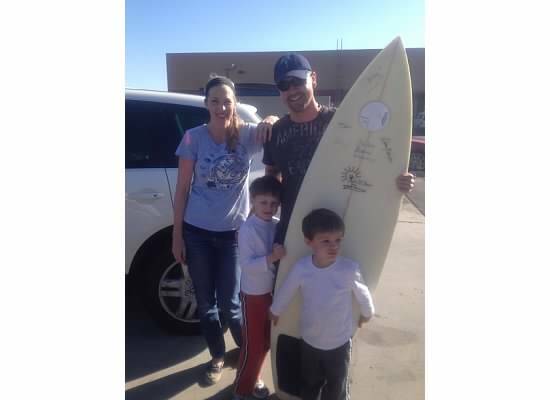 And several months later, we met up at a location about an hour from our home and grabbed Cannon’s board from these incredibly kind-hearted people…….Carlos and Jennifer. And they didn’t just throw it in a moving van. They drove cross country with it in a 2 door sports car! Are they incredible or what?! I still can’t believe it! 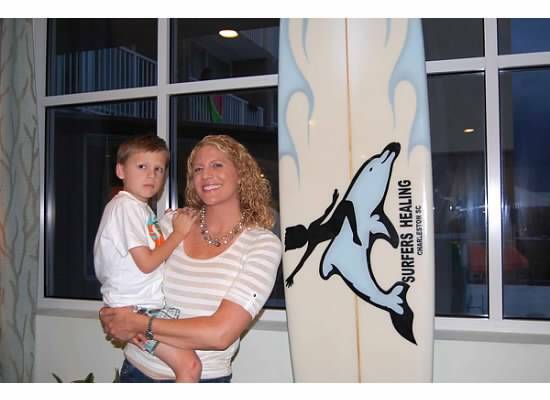 Surfers Healing is such a fantastic event! And we are also so grateful to the Tides Hotel’s Blu Restaurant for hosting the dinner! Thank you to Josh, Carlos, and Jennifer for making this happen for my baby! We will NEVER EVER forget your incredible kindness! I have some cool plans for this board! Can’t wait to share very soon! There are a couple of things on the horizon to catch you up on. So here goes……..
Cannon goes in for surgery next week. Wednesday to be exact. Every year that he has the Chait Button in his abdomen it will need to be swapped out for a new one. I am trying not to get nervous. It will most likely be just fine. Even outpatient if all goes perfectly. But there is a chance that the tube will not go back in. 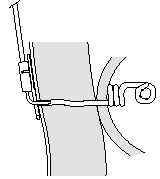 See, internally and underneath the tab that is externally visible is a long, spiral tube. It goes all the way into his ascending colon. Because of the spiral nature, it can be difficult to re-place correctly. I actually had someone write in to this blog once and tell me that this happened to their child. The up-side is that the procedure will be performed by an Interventional Radiologist. They will inject dye into the pathway and be able to watch what they are doing on a screen. Doing it this way has a higher success rate. So, we are hopeful that this will be a simple deal and he should heal quickly. When talking with the surgeon about when to do the surgery, my only stipulation was that he needed to be healed in time to go surfing in August. Now that we are scheduled for next week……we should be in very good shape by then! Cannon has been struggling mightily with getting sick during the daily flushing of his Chait Button for some time now. Since November really. And it has been progressively getting worse and more violent (projectile). We have tried a few different strategies but nothing was working. As you might remember, the flush started out as a 3 man job and had become a 2 man job. Due to “staffing,” I was having to wait until around 11 in the a.m. every day to perform it. Or I would have had to go it alone. Well, his G.I. doc finally said that I was going to have to do just that. We could not continue to allow him to get so sick and throw up all his food and morning meds. I would have to buck up and try to handle it on my own. So, I practiced for a couple of days with Mark there but me trying to do it by myself. You really do need all 4 hands but we figured out a way. And thank goodness, Cannon has been awesome and laying really still. I am happy to report that after a year of having his Chait Button…..the flushing IS now down to a one man job and Cannon is doing much better. Hasn’t gotten sick once since we started doing it this way! Thank the Lord. He has a lot of indigestion during but nothing on his stomach to omit. So, we are in good shape in that department! The scoop on Townsend is that we still don’t really know. The results of his EEG were negative. He had to be sleep deprived prior to the procedure but my stubborn little man managed to stay awake regardless. (Of course he was asleep within 5 minutes of the drive home, though.) So, the neurologist wants to be thorough and try one more time. Especially since this is a second episode. Next month, we will check him into the hospital for 24 hours and they will monitor him in a special room. (If you have been following our journey since the beginning, you may remember Cannon had to do this a while back. His was for 4 days, though.) He will be hooked to an EEG the entire time and the room has cameras with constant monitoring. We will see what happens with that in June……. Townsend wanted to say thank you to the firemen and paramedics who answered our cry for help when he had his seizure. So, what does our family do? We bake! We made some Chocolate and Peanut Candy as well as Malted Milk Chocolate Chip Cookies. 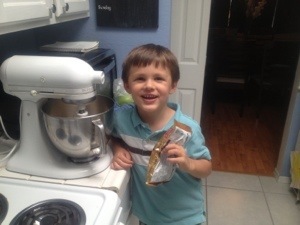 Townsend loves to bake with me so this was perfect. He also made some paintings and cards for them. 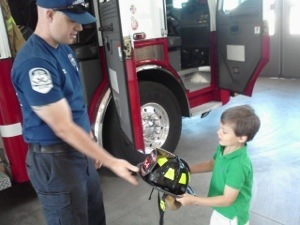 One Tuesday, when I took Cannon to town for all his therapies…….Mark and Townsend visited the fire station to deliver the goodies. Everyone there was so nice and “Mr. TJ” took him on a tour and let him check things out. When I got home, he was so excited to tell me all about it! To leave you on a funny note, I want to share with you a couple of examples of the typing program I am doing with Cannon. If you haven’t seen the news magazine show and later viral video of Carly……please look below and be amazed. It is the story of a non-verbal teenage girl with Autism whose parents were told that her IQ was incredibly low and that she did not have “much going on upstairs.” Therapists discovered that she was quite the contrary and began having her type. A whole new world opened up. It is just the best story! Have a look now if you have missed it! Anyways, even though Cannon is verbal-ish……I wanted to explore this concept with him. To see if his language might be more complex and/or articulate inside. So, here are some examples of our first couple of tries. I say something……and then he does. We alternate back and forth. Have a look and get a little laugh at my stubborn boy. I will share more in the future but this is a taste! He is not really happy about doing this just yet. But I have faith that he will get better and more confident with practice! LOL! Have a blessed day and we will be in touch soon! I love being a mom more than I could possibly put into words. It is all I ever wanted in life and it is all I ever want to do. 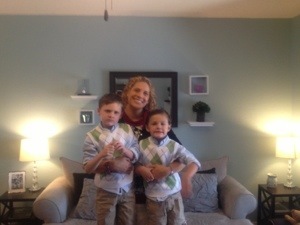 My two little boys are the greatest gifts God could have ever chosen to bless me with. My love for each of them is unconditional and is given with all my heart. I feel no different nor do I resent my job just because Cannon is a different kind of child. I actually know that his challenges make me a better person. One with far more empathy, patience, strength, courage, endurance, and love than before. I didn’t choose this road. God chose it for me. But if it had to happen, I am thankful for the refinement that comes alongside. Don’t get me wrong. There are days…….Days when I can’t see straight from exhaustion, frustration, and misery….. and I don’t know how I will make it the next 10 minutes…..much less until tomorrow. One day last week was particularly tough. Cannon was angry for no apparent reason. Really angry. At one point, I had to hold him to keep him from hurting himself. It was bad. Really bad. I found myself begging, no pleading, with him to look in Mommy’s eyes. I thought that if I could get him to, even just for a second, he would see the love in them and feel safe. And stop fighting. That didn’t happen. But I won’t stop trying. EVER. I will always believe that my love has the potential to help him to make great strides with his battle with Autism. This next pic has some validity to it. I believe in the one and only God…..therefore I believe with all my heart that everyone has a God shaped hole in their heart that only HE can fill. 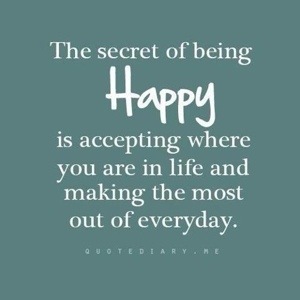 And that is the only way to true happiness and fullfillment. But I also think that you have to do what this pic says and accept your life for what it is. I would never have chosen to have a child with Autism or one with seizures….but I get no where if I don’t accept it. And life with Cannon will never be perfect…..but it can still be good. And we can still enjoy life and make the most out of it. Celebrating even the smallest of victories and accomplishments. Moving on……My Mother’s Day this year was simple but precious and fun at the same time. It included church, sushi and key lime pie for lunch (yum! ), nap/cuddle time, sweet gifts, a photo session for the boys with a dear friend and photog, and ended with us all having dinner at a fave restaurant. And I considered this my gift from Cannon. What you are seeing here is what we call the “bean bin.” A large plastic bin filled with about 60 pounds of beans and various plastic letters, animals, and other treasures. Sitting in this and sifting through the beans to find the treasures has an amazing and calming effect on him. Back when things were so bad with his belly……this was the only thing that had a chance at calming him down. It is magic! 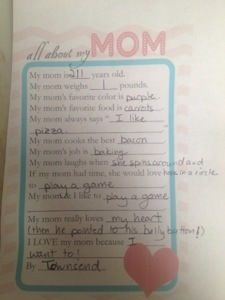 Anyhow, on Mother’s Day, Cannon was playing in the bean bin and spontaneously began singing his first made up song!!!!! It may not sound like much but when you think about how he lost all his speech just a couple years ago…..it’s fantastic! Did my heart so so good on a day that was supposed to celebrate me! Lastly, I want to send you off with a look at this video. A tribute to all the mommas out there walking the special needs road. One we didn’t choose. But one we do choose to step up, accept, and do our very best to give our kids the very best life. God bless ALL the mommas out there! We flew back east in August to participate in the event on Folly Beach in South Carolina. Missing school was no longer an issue as we had to pull him out and homeschool this year. We stayed out at the Tides Hotel whose beachfront was hosting the event. My sister and I went down early that morning to get some photos of the set-up and also to participate in the Opening Ceremonies. Something I didn’t do last year. We were thankful for the dedication of the volunteers….. getting things set up quickly and efficiently. And the Opening Ceremonies really set the tone for a great day! They began with a guy playing the national anthem on his saxophone. Then, there was a prayer by a man who is the head of the Christian Surfers Association and later a prayer and chant in Hawaiian by another surfer. Izzy Paskowitz, founder of the org, talked for a bit after this. 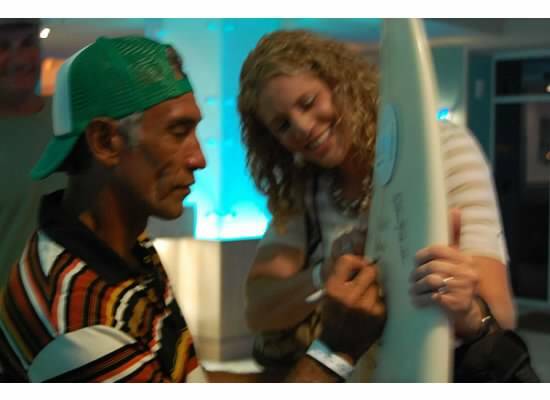 Greeting everyone, telling them about his son who has Autism, and how Surfer’s Healing came to be. He also said something that saddened and stuck with me. “Failure is not an option.” A motto of his that relates to his family and his marriage. He said that he is seeing far too many single parents bringing their kids to camp and that we have to try to stop this epidemic. The divorce rate for parents of kids with Autism has been reported to be 80%! Staggering! He said we have to fight for our kids by adopting this motto and keeping our family’s together. I couldn’t have agreed more! Then, he passed the mic to his 90 something year old father who said he had traveled all the way from Hawaii to deliver a message. Dorian “Doc” Paskowitz talked for quite a while about a lot of topics but I think the main thing that he was trying to bring home was that he sees too many Autism parents blaming themselves. And that that needed to stop. He is a Stanford educated doctor and believes that there are environmental components to Autism but that even still……stop blaming yourself and focus all your energy on getting all the help you can for your kiddo. 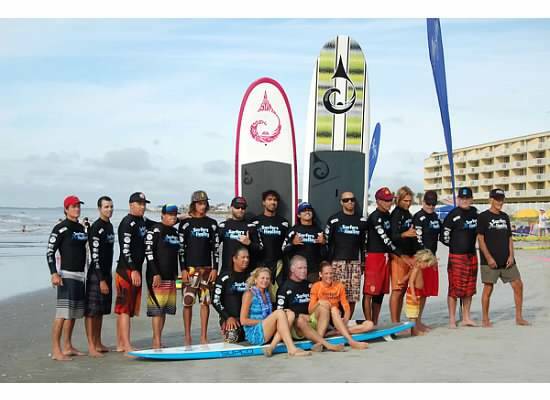 After that, a picture was taken of all the surfers and the AMAZING woman (Nancy Hussey) who coordinates the event for the area. And then, they took to the water! Starting with the kiddos who had been assigned the first time slot. I rejoined my family to do Cannon’s flush and prepare for the day ahead. Cannon’s surf time was 3:30 and it was hard to hold him off for so long. Registration was brief when we got down to the beach and we had barely had time to set up camp before they were calling early for our group. I had to work quickly to gather my family members who had scattered a bit. Then, I walked Cannon over to the ready tent. There they get the kids fitted in life jackets and walk them down to the water’s edge to meet their surfer. 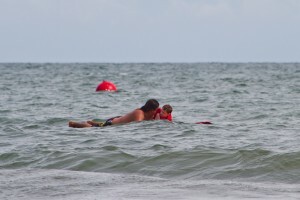 I did ask if Duane, his surfer from the previous year was available, but he was already out with another kiddo. I started to get very nervous now. What if something happened with his Chait Button? What if it became dislodged? I had the medical supplies necessary to put a new but temporary replacement back in but am still quite scared at the possibility of actually doing it! Prior to the event, we had checked with the local children’s hospital and knew exactly which doctor to request if we ran into trouble. One of few docs who are familiar with his rare device. But regardless, it was still scary. When we first met the administrator and his surfer, I had to explain what he had and where it was exactly as it was hidden by the protective band that he wears. I talked with his surfer for a few moments about how best to handle him. His surfer’s name was Kalani and he is a young surfer from Hawaii. He had a warm smile and an obviously kind heart. 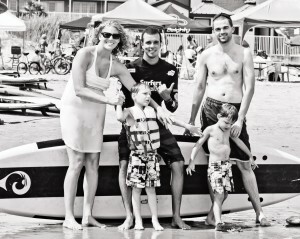 Cannon was soooo ready to go as they got him on the board and paddled out! What followed was nothing short of complete and total bliss from my kiddo! He was in his version of what a glimpse of heaven will be like! As a mother, there is nothing better than watching your child THIS happy! My face was hurting from smiling so much! About 20 minutes later…..they were done. Cannon had had a blast but he was still hoping for more! He was not a fan of getting out of the water! We had to pretty much force him into a photo op with Kalani. After saying lots of thank you’s, giving hugs and high 5’s…..we headed up the beach to get his medal. 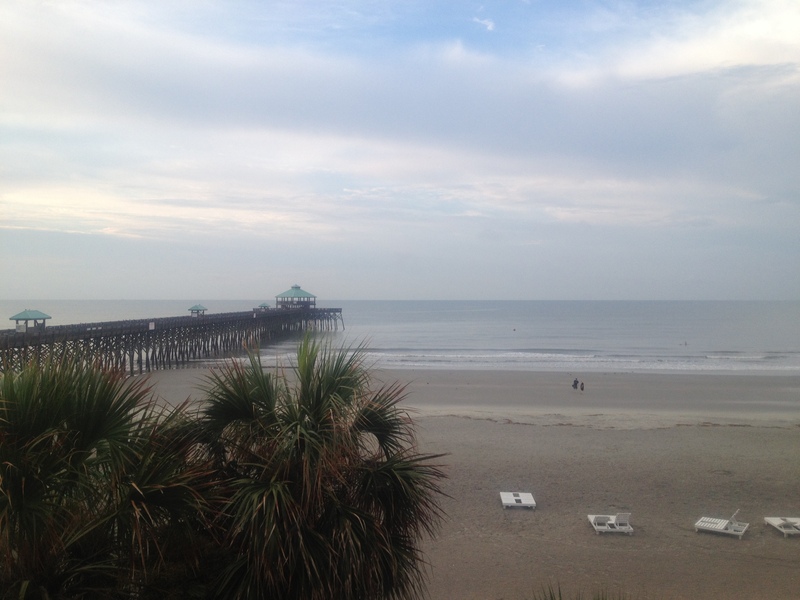 All participants get a medal and an additional photo op in front of Surfers Healing Folly Beach logo-ed surfboard. Cannon took the medal off and ran all the way back down to the water before I could catch him. “More surfing” he kept saying. My little adrenaline junkie! So, I retrieved him really quick to allow the professional photogs there to get a pic. I had brought along his Beads of Courage as well and we draped those around his neck in addition to his medal. This was definitely the year to include those! After all this, we let Cannon go back in the water. To splash around and jump in the waves. 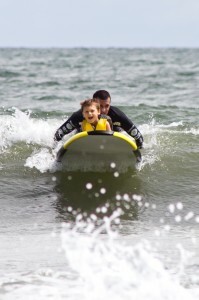 He was more content now, even if he did prefer to be surfing. Then, something kind of crazy happened. Mark and I were just standing together by the water’s edge and a man walked up to us. I hadn’t even noticed him nearby or who it was until I was mid-handshake. 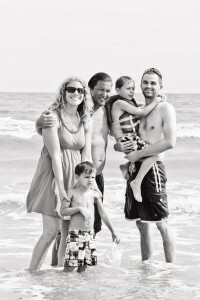 It was Izzy Paskowitz, the former competitive surfer and co-founder of Surfers Healing. He introduced himself and said hello. I shook his hand and immediately launched into major thank you’s! Thanking him and asking him to thank his wife, Danielle, (the other co-founder and who had responded to my email plea) for allowing us to switch camps! 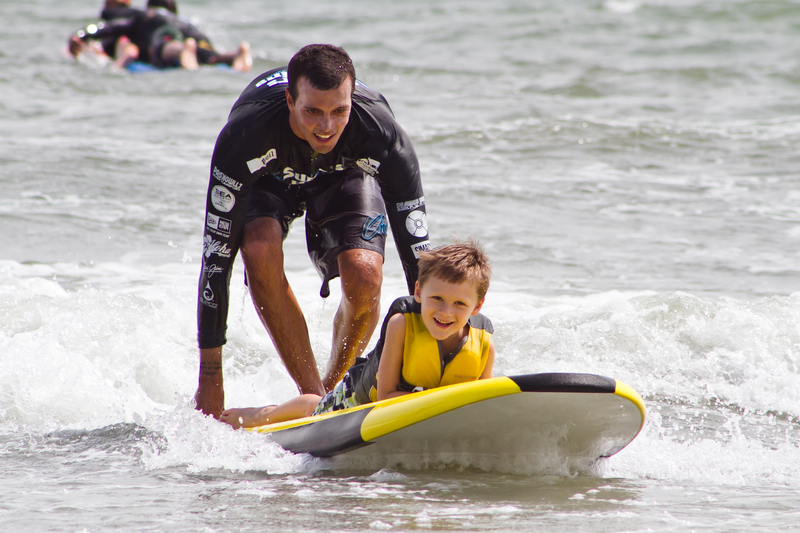 I told him how much it meant to us to have that time to heal from surgery and still get to participate in surf camp! 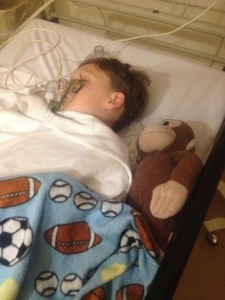 He hadn’t heard about our situation and asked us to tell him about Cannon, his story, and why he had to have surgery. So, I obliged. Telling him an abbreviated version of the journey. I think he was pretty surprised at the enormity of it all particularly with the G.I. issues. He asked us where we lived and we told him. It’s quite far from South Carolina and he was surprised we had made the trip. We told him that we’d do anything not to miss Surfers Healing. He then asked us to point out Cannon. We did and then he said something A-MAZING! 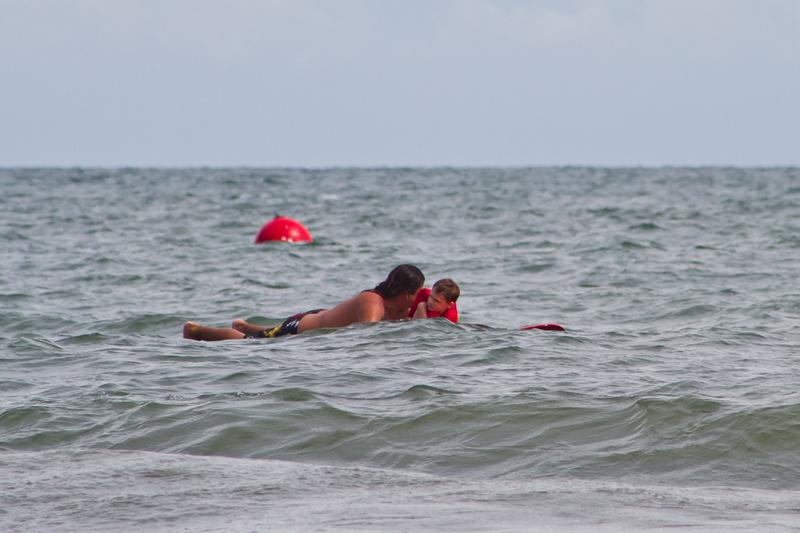 He said, “Get a life jacket on him……we’re going surfing!” I couldn’t believe it! 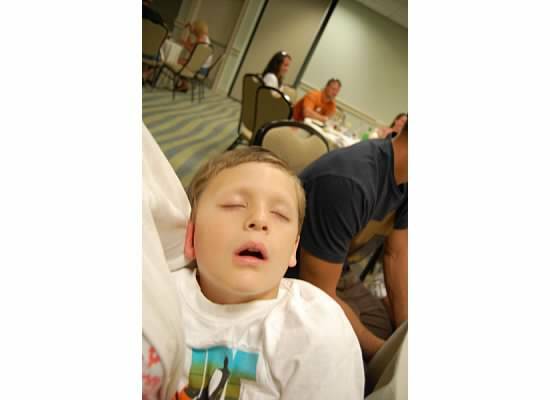 The incredibly long day was over for him! He had been surfing since at least 8:30 that morning and it was after 4 p.m.! The event was being packed up! People were leaving. And now, he wanted to take Cannon surfing! Unbelievable! 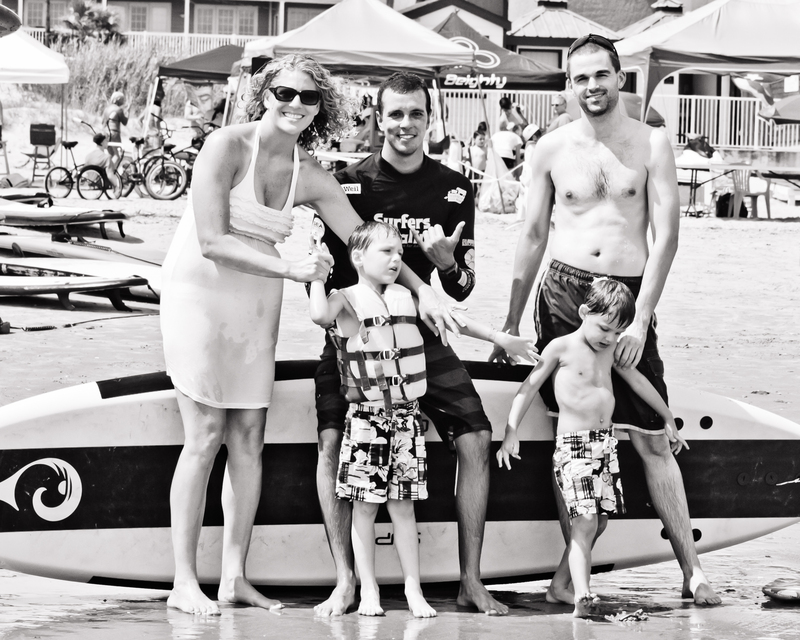 We grabbed Cannon, found a life jacket, and brought him to meet Izzy at the water’s edge. A handler of sorts helped Izzy get Cannon on the board and pushed out. I couldn’t believe this was happening! Our little entourage was bursting with excitement! Mark, myself, our Townsend, my parents, sister, aunt, and good friend, Becca. All watching in awe! And you won’t believe it but they were out surfing for almost 45 minutes!!!!!!! They spent a lot of time beyond the breakers…..just floating. It was so calm out there. So peaceful. Relaxing. Cannon was just lying on the board. Completely and totally comfortable with his surroundings. Like this was a perfectly normal place to just chill. Izzy’s intuition when it came to Cannon was impeccable. It was obvious how well he understood what his little body needed. 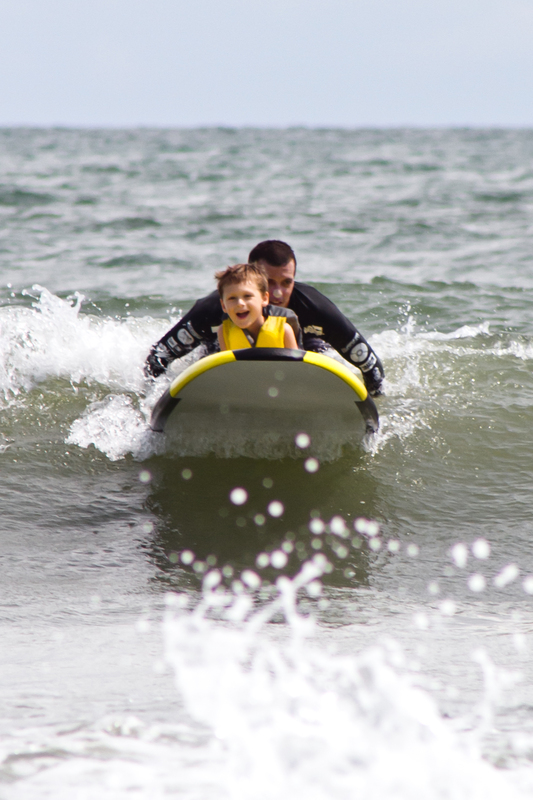 It needed the relaxation of the calm water…..but it also needed the rush of riding in on a great wave. They did both for the longest time. It was simply incredible! The entire event was taken down and everyone was gone long before they were finally done surfing for the day. The day wrapped up with more hugs, tear filled thank you’s, and a promise to say hello at the dinner later that night. The Tides Hotel, that hosted the event, also hosted a dinner for all participants, families, and surfers that evening. There wasn’t much time now to get ready for it! So, we all took off to do so. I will tell you about the dinner in my next post! Now, PLEASE go watch the video! I hope that it gives you a complete picture of what this amazing day was like for our little hero! 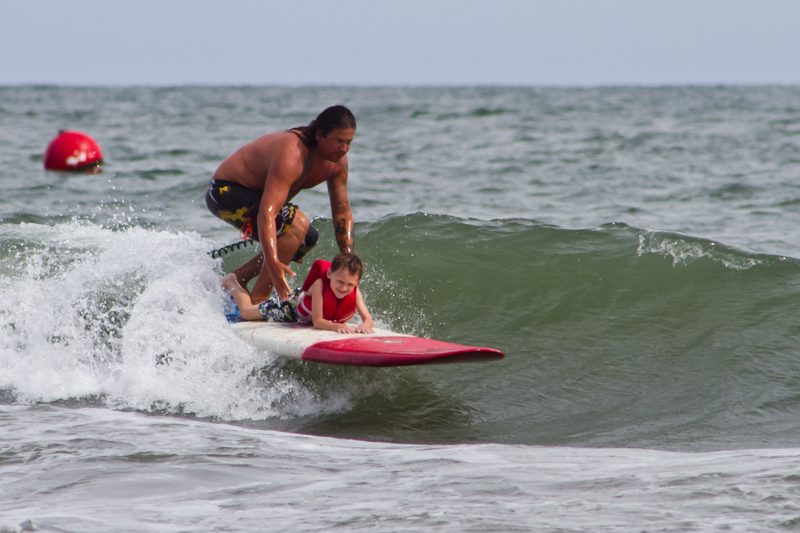 I will never, ever be able to thank Surfers Healing enough for bringing surfing into our life and allowing Cannon, a child, who has grown up in the desert, to realize his love for it! May God continue to bless Izzy, Danielle, and Surfers Healing!!!!!!! !